The Rangers took a 3-0 lead into the 3rd period Sunday night at The Garden, but couldn’t hold it, eventually losing to Winnipeg in a shootout, 4-3, wasting a terrific performance by Henrik Lundqvist. It was a night that saw the team honor former Blueshirt Vic Hadfield, retiring his number 11 up to The Garden’s rafters alongside former linemates Rod Gilbert and Jean Ratelle. New York got a late 1st period goal [at 17:32] from Jesper Fast, who celebrated a birthday Sunday to make it 1-0. Fast played give-and-go with Mika Zibanejad, who had just left the penalty box. 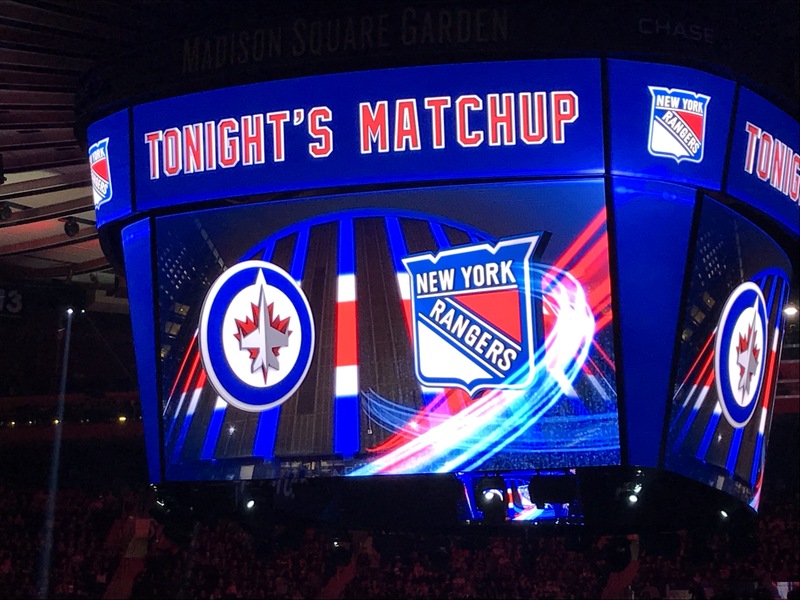 Then in the 2nd period, Marc Staal‘s wrist shot past Conor Hellebuyck at the 12:11 mark made it 2-0 Rangers. Chris Kreider‘s goal with 1:06 to go in the period made it 3-0. Kreider deflected Zibanejad’s shot into the net for his team-leading 14th goal. With 20 minutes to go, it looked like the Blueshirts might beat Winnipeg, one of the league’s best teams, but the Jets got two early goals to tighten things up. With Brendan Smith in the box for an ill-timed cross-checking penalty, the Jets got a power-play goal from Mark Scheifele at 2:10 to make it 3-1. Jack Roslovic followed at 4:36 to make it 3-2, on a shot that Lundqvist didn’t see until it was past him. Then the Rangers seemed to slip into a ‘prevent’ mode instead of an aggressive one, trying to play out the final 15 minutes and escape with a win, but Bryan Little‘s goal with 2:30 to play tied the game, 3-3. After a scoreless five-minute overtime, the Jets got shootout goals from Patrik Laine and Scheifele. Zibanejad was the only Ranger to score. Lundqvist stopped 39 of 42 shots. The Rangers only recorded 19 shots on goal in the game. Staal had a goal and an assist. Zibanejad had two assists. The Blueshirts are now 1-4-1 in their last six games. The Rangers [now 13-12-3, 29 pts] are off until a game Saturday night in Miami against the Panthers.